The Spyderco is by far one of the most reviewed knife sharpeners on Amazon, and I think it’s only fitting I write a Spyderco Sharpmaker Review of it for those who are curious to learn how it works. After sharpening just three knives, I wanted to write a review and respond to those who had given it a one star, which I did. Heck! If I sound happy about this product, you bet it’s true! This state-of-the-art sharpener belongs in every kitchen. This item works and works very well when you get the hang of it. Being a chef by trade, I have had over a dozen tool sharpeners in my life, and this really beats all others I have used or owned. I can go on and on telling you how amazing this sharpener is. Not only are the instructions accurate and easy to follow, but it is also super easy to use and is sold in a case that’s small and easy to store. Even better, its triangular porcelain sticks are rather versatile in their use. One of the most annoying and risky things to encounter in the kitchen is a dull knife. A dull knife makes normal, easy tasks more and more dangerous than they have to be. 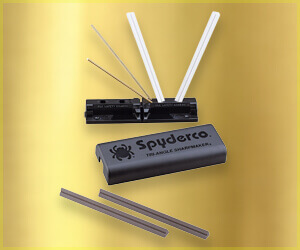 The Spyderco Sharpmaker is incredibly simple to use. If you can handhold a knife at a 90-degree angle, then you can use the Sharpener. Basically, you put the base on a strong flat surface, put the rods into the base, hold your knife vertical to the floor, and run the edge of the knife up and down the rods; It’s so simple even a cave man can do it. The Sharpmaker is undeniably an indispensable knife sharpening tool. It has the advantage of being portable. Even if you’re living in a small apartment, this is something that could live in a drawer until the next time you need it. Periodically clean the ceramic sharpening stones with Ajax or a similar powdered abrasive cleaner. Be careful while cleaning not to drop them as they are fragile and can break easily. Ceramic is porous, and you’ll see the rods fill up with small metal flakes. For the rods to work efficiently, clean them out. This Knife Sharpener is without a doubt a practical and versatile add-on to your workspace, and getting one means you can stop thinking about blunt blades! Even better, this premium product features triangular ceramic sharpening rods and if you want to get really fancy, you can always order ultra-fine and diamond rods for the Sharpmaker. It comes with a limited lifetime warranty that covers consumer use only, and not commercial or industrial use. This means you can have peace of mind knowing that the company has you covered in case something isn’t right with your tool. Besides being an exceptionally versatile knife sharpener, the Sharpmaker has a moderate price point. I have mentioned that since I have personally used and found that it is one of the best pocket-friendly ways to get your knives as sharp as you need them to be. Admittedly, The Sharpmaker tops the list of the best manual knife sharpener class. It is gentle on your expensive knives and removes less material than electric knife sharpeners, hence prolonging the useful life of your blades. Q: How hard to you press down while sharpening? A: No, you don’t. The key is an even consistent stroke every time. With the Spyderco Sharpmaker Review, you can literally restore a factory edge to your knives in minutes. Even better, it enables anyone to sharpen a knife effectively with just a few minutes’ practice.I would definitely recommend it to any chef. Not only will they get a great tool sharpener, but the features are also amazing. The quality and durability of the product are second to none. A blunt knife is a chef’s worst enemy, and the most unsafe tool you can have in your kitchen. Luckily, sticking your knives in good condition to use isn’t that difficult and you most likely already have the tools needed to do it.